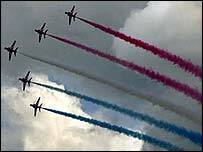 The air show at RAF Cosford in Shropshire has been cancelled for the first time since the event began 25 years ago. The organisers have made the decision because they do not know whether there will be enough military aircraft to take part in the event as a result of the Iraq crisis. The show is the biggest single-day public attraction in the Midlands, drawing crowds of up to 50,000 people. The event had been scheduled to take place on 8 June. The air show's organisers said the decision has not been taken lightly, but that uncertainties over events in the Gulf have made the action necessary. A spokesman said the early cancellation would safeguard future funding and enable the event to continue in years to come.